On November 4, 2013 I flew Turkish Airlines Business Class from Istanbul to Kuala Lumpur. Flight TK60 was originally scheduled on an Airbus A340-300 which had the old business class product. Fortunately, there was a last-minute equipment change to an Airbus A330-300, which had the new business class. FYI All Turkish Airlines Boeing 777-300ER and Airbus A330-300 aircraft feature the new business class with full-flat bed seats, whereas the A330-200 and A340-300 have the old business class with angled seats. I had been unable to select my seat at the time of booking, which resulted in most seats already being assigned at online check-in (24 hours before flight). Seat 4E turned out to be a great choice (A330-300 seat map), as it had the nice Turkish Airlines logo in the background, gave me a good overview of the cabin and, the cherry on the cake, an empty seat 4D while all other seats in the cabin were taken. Turkish Airlines is famous for its inflight catering by Turkish DO & CO. All THY long-haul flights have a DO & CO “Flying Chef” onboard, a crew member solely dedicated to inflight catering in Business Class. 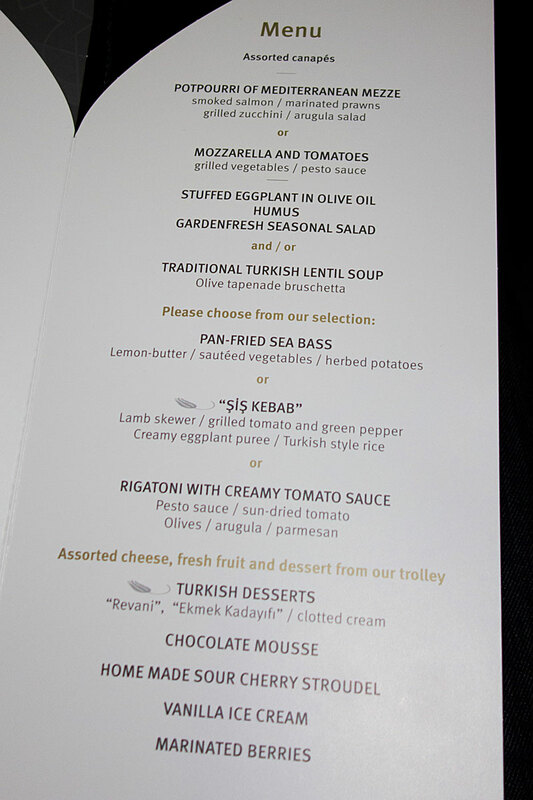 No wonder Turkish Airlines won the Skytrax Award for “Best Business Class Catering” in 2013 and “World’s Best Economy Class On-board Catering” in 2011. 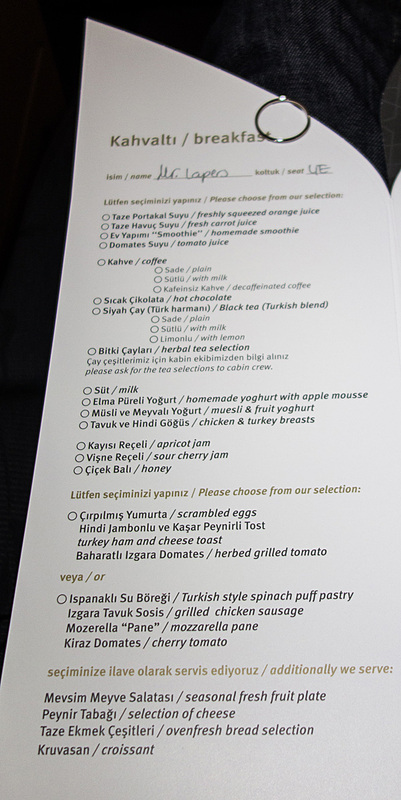 End of October 2013, DO & CO started rolling out a renewed catering plan which will be available on all Turkish Airlines flights by the end of Feb 2014. 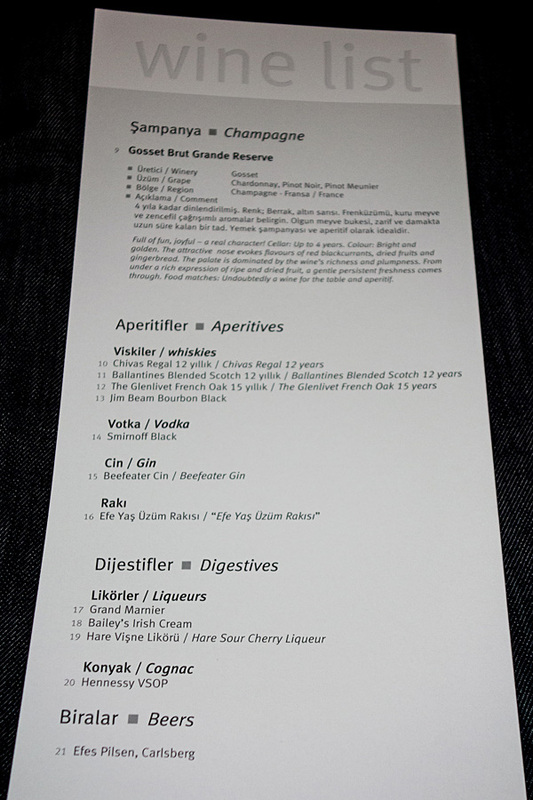 I was lucky to be on one of the first flights with the new DO & CO catering. Surprisingly, the meal service started with a Godiva praline, something you would expect at the end of dinner. 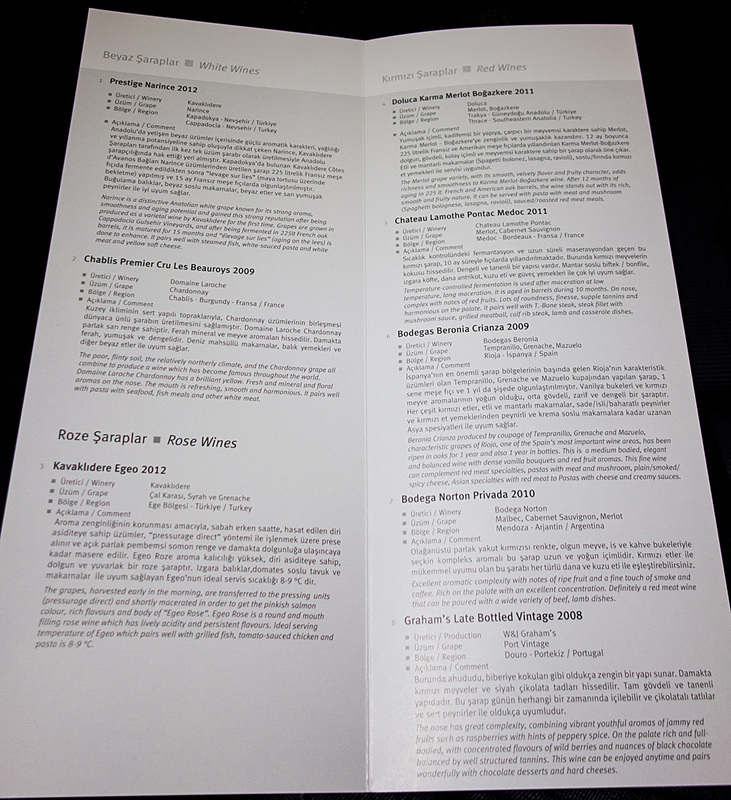 Let’s have a look at the extensive business class menu. After the delicious “Candlelight Dinner High Above The Clouds”, it was time for a good night of sleep. The full-flat bed seats on the A330-300 were incredibly comfortable. I also liked the Turkish Airlines blanket a lot, felt great. The combination of the ultra comfortable bed and my Bose QuietComfort 15 headphones allowed me to sleep 6 hours without interruption. After a good night of sleep, it was time for my personalized breakfast. At dinner time, the DO & CO Flying Chef had taken note of my breakfast preferences and served it exactly as requested in the morning. Great service! 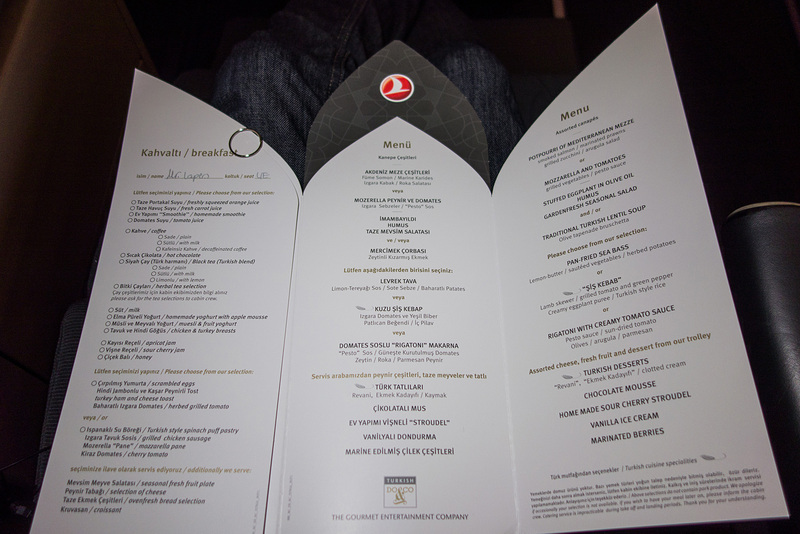 Overall, TK60 was an excellent Turkish Airlines business class flight. The hard product and catering were outstanding with an attentive crew on board. 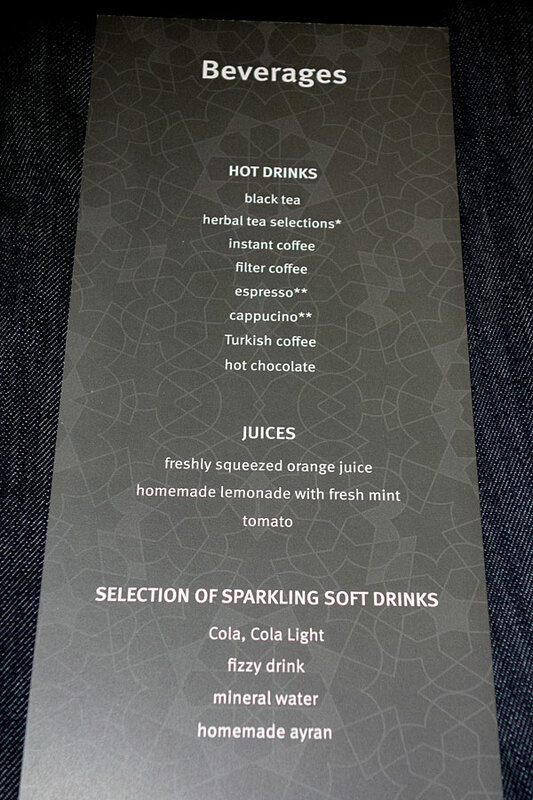 I had also a great experience at the Turkish Airlines CIP lounge in Istanbul pre-flight. Unfortunately, my experience on the inbound flight TK61 from KUL to IST was less pleasant. Upon boarding, I was welcome with ‘no pictures allowed’ by the purser when pointing my camera to an empty business class cabin. The tone was set for this 12 hour flight with a number of other issues surfacing later on. I have filed a complaint at Turkish Airlines customer service about my TK61 experiences and expect their feedback soon. Hopefully, my troublesome TK61 flight was an exception, with my wonderful TK60 flight being the Turkish Airlines Gold Standard. Have you flown Turkish Airlines before? What were your experiences? Thanks for sharing! I really love TK but their service can be a hit or miss … there is no realy ground inbetween. Earlier this year I also flew in C class on the A330 with TK and the crew made me feel that the business class passengers where just annoying and they would much rather just chat in the galley. I have had fantastic experience flying Turkish Airlines. I think they were the first to have free wifi on board. Awesome photos! Crisp and bright. May I ask what kind of camera you use (sorry if you stated it before but I just started reading your blog.) The TK purser refusing you to take photos reminds me of United Airlines. They didn’t run out of food options. I just love DO&CO, wish they did the LH inflight catering too! Forgive my ignorance but I actually haven’t heard of DO&CO until now. From doing more research on the company, it seems to me other airlines use it too http://www.doco.com/en/airline/customer-portfolio I am not sure which routes the other airlines use DO&CO catering but that list had quite a number! I live in New York City and it was interesting to see DO&CO caters the JFK Emirates lounge. I’ve been there a number of times since I used to be an EK gold member and was always impressed by the delicious all-halal food! İf a330-200 or 340-300 then 2 level lover. I flew 3 weeks ago with Turkish Airlines in economy from Brussels to Istanbul to Johannesburg / Capetown and back (TK1940/1937 & TK40/41). For being voted Europe’s best airline by Skytrax, my expectations were very high, but Turkish didn’t satisfy me. Service was just average (to earn that status of “Best Airline”, all the details must be perfect and it wasn’t). The food of Do&Co was ok, but not WOW. Seems there was also not enough staff onboard. I rate them 7/10 in economy. Business class seemed indeed a lot better with the dedicated chef onboard. Uitstekend! Ik wil graag proberen voor mijn volgende reis naar KL. Misschien volgend jaar maar ik wil mijn siège kiezen voor de vlucht !